In 1934 Roger Tory Peterson published his Field Guide to Birds. The book was designed so that live birds could be readily identified at a distance by their patterns, shapes, and field markings. This book introduced the “Peterson System”. This system has grown to over 50 volumes on a range of subjects from plants, rocks, astronomy, insects, and animals. Now we have the Peterson First Guides which are smaller field guides -- just the right size to take out to the field, or in this case, into the garden for the identification of caterpillars. Why should we care about identifying the caterpillars in our gardens? Besides being very interesting, we should learn to identify the caterpillars of the insect species that we would like to encourage in our gardens. Butterflies are beautiful as they flit in and out pollinating the flowers. Don’t forget the moths. Moths are just as important as butterflies in pollinating our plants. Have you ever seen a hummingbird moth? This is a very busy pollinator. If we can identify the caterpillar, we will know if these caterpillars eating a small portion of the leaves of a beloved tree are a species we want to encourage to stay in our garden, or discourage their time spent here. We discourage the use of pesticides at any time and would instead encourage pruning out the branches that any ‘non-welcome’ caterpillars inhabit. If a pesticide is absolutely necessary, identification of the specific caterpillar is necessary, along with the research to know the correct time in the life cycle of this insect to use a pesticide, and the correct pesticide to use. We can’t say it enough: Pesticides are non-discriminatory, and they affect the ‘good’ insects along with the ‘bad’. This lovely little First Guides Caterpillars begins with the life cycle of Butterflies and Moths, detailing each stage. 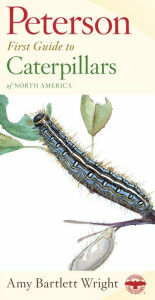 There is an explanation of the structure of the caterpillar, protection and defense, and even how to raise caterpillars (hint: provide shelter and their favorite food). Descriptions of the different body types is fascinating; smooth, hairy, bristled, bumpy, knobs, rear horns, filaments, and slug-like are all illustrated in simple drawings. The guide includes color illustrations of the 120 specimens with the caterpillar next to that of the adult butterfly or moth. Looking closely at the Swallowtail illustrations, I notice that each of the Swallowtail caterpillar types have subtle markings differentiating one from the other, giving a hint as to the specific adult Swallowtail it will become. I just spent 45 minutes looking at the illustrations again. Indeed, it is easy to get lost in this little book. I highly recommend it for every gardener, young and old!